A wide array of orthodontic issues can be corrected without the need for painful, unattractive metal braces. Kathy Zahedi, DDS & Associates, located in Santa Monica, California, has improved the smiles of countless patients with the invisible Invisalign® removable tray system. Invisalign is an orthodontic system that straightens teeth, adjusts the spacing between teeth, and corrects other alignment issues without the use of mental brackets and wires. 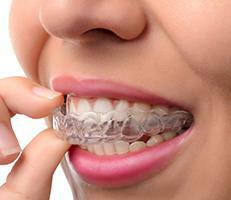 Instead, Invisalign utilizes a series of removable and invisible plastic aligner trays. The trays fit snugly over your teeth but are easily removed to eat, and brush and floss your teeth. The plastic used is smooth, so aligners are totally comfortable. Metal braces, by comparison, often cause gum irritation. Dr. Zahedi scans or takes an impression of your teeth, which is used to create a 3D model of your mouth. Then she maps out a treatment plan detailing how your teeth will be realigned over time. 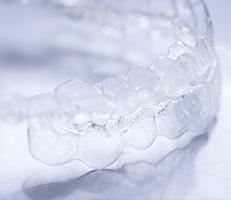 The treatment plan and 3D model are sent to Invisalign, where your series of custom aligners are made. Each aligner is worn for 1-2 weeks, gradually moving your teeth into the desired position. The duration of treatment varies depending on the extend of the movement required to achieve the desired goal. How often will you see Dr. Zahedi while wearing Invisalign? It’s important to schedule regular follow-up appointments so that Dr. Zahedi can track your progress, verify teeth are shifting properly, and make sure treatment is going as planned. The frequency of follow-ups depends on each person’s treatment plan. If you change aligners weekly, you may need to come in more often than patients following a 2-week schedule. Be prepared to wear your aligner all of the time (except when eating and brushing) until treatment is finished. If you take it out and forget to put it back in, or you have any issue that prevents you from wearing the aligner, you won’t get the expected results. Treatment typically takes 6-18 months, depending on the severity of misalignment, but Dr. Zahedi will lay out the time frame and follow-up appointments right from the start.